Interment Trust Services | Interment Trust Services offers investment services, account management and record keeping services to cemeteries and funeral homes across the country. Now you can quickly access participant information from your mobile device! We want to make sure you are getting the most from your Pre-Need and Perpetual Care account services. Funeral homes and cemeteries are unique businesses. Each day you are called upon to offer advice, provide guidance and comfort your families while maintaining a running business. From monthly record keeping to the management of Pre-need and Perpetual Care accounts Interment Trust Services can help. With Web Access track all of your accounts from one easy location. Plus, you can get, review, complete and print your forms online. Interment Trust Services can help you manage your Pre-Need accounts to keep pace with inflation. Assets are held in trusts and conservatively invested to protect the principle. 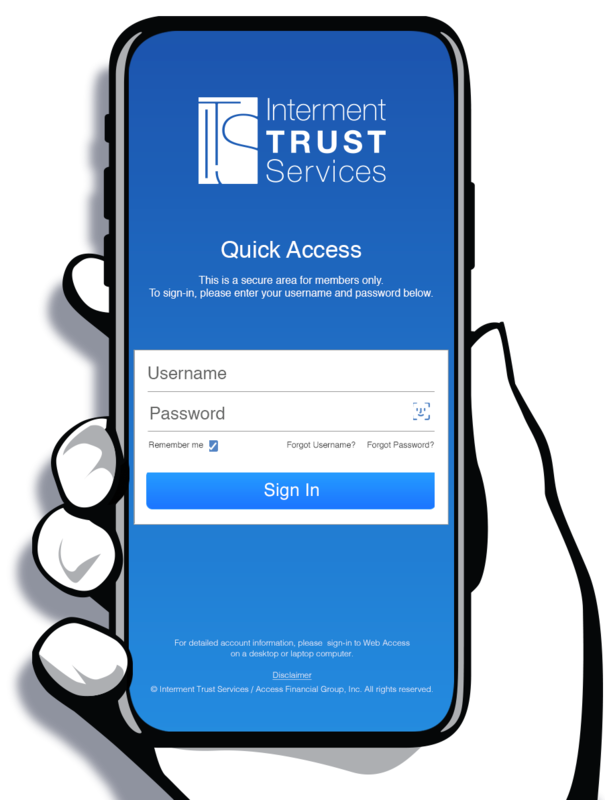 You can use Interment Trust Services Web Access, a unique online account status program to keep track of your accounts. Interment Trust Services can help you invest both Pre-Need and Perpetual Care accounts in funds appropriate to the account type. From burial costs to maintaining grounds and buildings, your resources will be will be there when you need them.